Because we’re in Maine, and Maine and blueberries go together, we’ve taken a classic cookie recipe and updated it with dried blueberries and white chocolate. How did this one come about? I have never made oatmeal cookies before. It’s not that I don’t like oatmeal, I do. I really don’t like raisins. I really don’t like raisins! So I’ve always steered clear of these cookies. One day, while browsing in our local Maine fruit store, I came across dried blueberries. I do love blueberries so bought them thinking I would figure out what to do with them later. 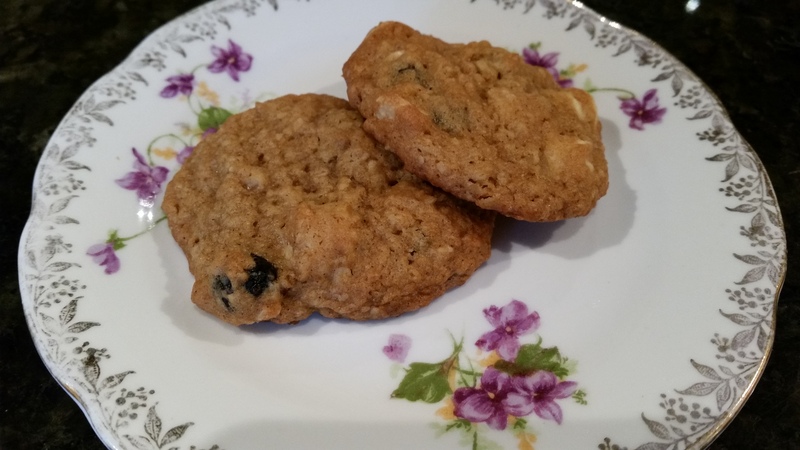 It finally occurred to me to substitute the blueberries for raisins in an oatmeal cookie. And while we were at it, decided to throw in some white chocolate chips too. And that’s how a new cookie was born. These are a firm favorite with 1802 House guests. We hope you enjoy them too. In stand mixer bowl, cream together the butter and both sugars until smooth and light. In a separate bowl, whisk together the flour, baking soda, baking powder, salt and cinnamon. Add flour mixture to the sugar mixture and beat on low just until mixed. Do not over beat. With a spatula, by hand, blend in the oats. When fully mixed, fold in the blueberries and chocolate chips. Line two baking trays with parchment paper. Drop dough by teaspoonful (about the size of a golf ball) onto cookie sheet, spacing about two inches apart. Bake 10 - 12 minutes until light golden brown. Remove from oven. Allow to cool for 10 minutes before removing from the cookie sheet to finish cooling on a wire rack.